There are many things that I love about Europe, but one of them is the seasonal availability of asparagus, straight from the farmer. These organic asparagus cost us in the region of €4.50 a kilogram and we always buy a bundle when we are travelling. When we were on the Midi Canal we walked past many asparagus fields, and it was the first time I had seen them growing in abundance. I understand that they are fairly labour intensive, but despite the price here in South Africa for asparagus, I will always buy them when they are in season. My friend Kim is looking after some asparagus fields in Australia. The farmer is away on holiday, and the asparagus need to be harvested each day or they will bolt. Kim’s farmer friend has given her a recipe for asparagus soup which she says will freeze very well. I have adapted the recipe to suit my cooking style, and it made a very good lunch for me yesterday afternoon. do you buy fresh asparagus when it is in season? That is one gorgeous looking soup. Breaking the yolk and slurping all the golden goodness with the asparagus cream would be so YUMMY! I love asparagus…have some in the refrigerator now. I guess I am spoiled because our market has it year round. Your soup looks delicious. This will be a huge hit in our home where my children love asparagus. I love the look of that egg yolk in the soup! I love fresh asparagus soup. Yours sounds and looks amazing. So perfect for this weather! Love asparagus – in fact bought some last night so this is very well timed! I love fresh asparagus and can never resist buying it. I haven’t made asparagus soup for the longest while, yours looks lovely – I usually just steam them and sprinkle them with salt, pepper and lots of lemon juice. I love asparagus although it took me a while to realise it because as a child I had only ever had it out of a tin. The tinned stuff is vile! 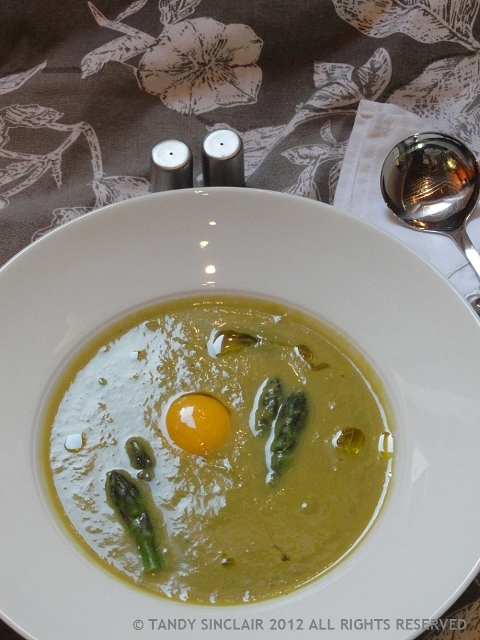 I love the idea of adding an egg yolk to asparagus soup. I love to dip asparagus tips in a boiled egg instead of soldiers so I am sure I would enjoy this soup. I also don’t enjoy tinned asparagus!